Can You Really Make Money With The Stash App? 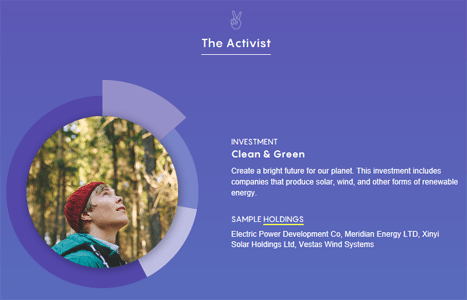 This is an interesting tool that will basically allow you to start investing with as little as $5. But can you really make money with the Stash app? To be clear, Stash is not a way to make money. In fact, the #1 ranked article for Stash written on CNBC is clearly a sponsored post, or at least outsourced to a mid-level writer doing a puff piece on the app. Here's an interesting quote from the article titled I used an investing app for the first time and it made for the easiest $300 I ever saved [source] (Emphasis is mine). To be clear, most of the $304 came from my own wallet. My contributions, minus the $1 monthly service fee Stash charges, totaled $286. But that's money that I might have spent had I never set up the automatic $5 transfer. My return for the year of $18.13 isn't anything to write home about, either, but had I put $286 in my savings account, which offers an interest rate of 0.01 percent, I would have earned just a few dimes. Even if I put that money in my high-yield savings account, which earns 1.45 percent a year, I would only have earned about $4. In other words, it's just a way to start a new bank account. Then only way you'll make money is to trade stocks successfully, which many experts can't even do successfully. Plus, it puts your money at risk! Stash has a great advertising team, but this is just another investing app, and not a way to make money. Getting Started: What Is Stash? Stash is basically an investing app, not a way to make consistent income unless you are investing in stocks that pay dividends. In other words, it's going to take money to make money with Stash. Investing apps are on the rise! 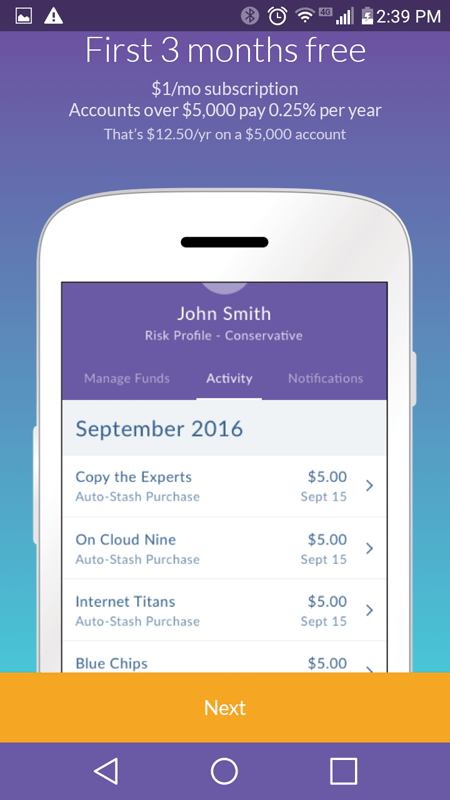 Gone are the days where you need an expensive and cumbersome stock-broker to handle transactions that should be easy… and Stash is just one example of several new apps that have been designed specifically for this purpose. Learn how to invest with Stash and start building your investment portfolio today! 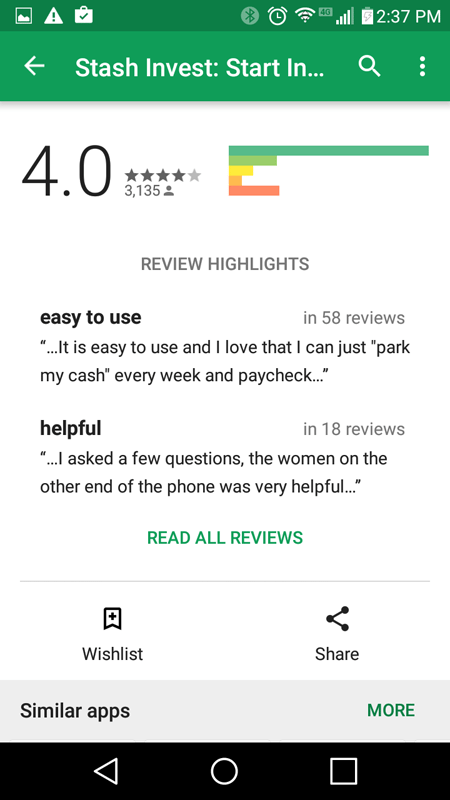 The app has 4 stars on Google Play, which is pretty impressive. It has been reviewed by just over 3,000 users, and has been downloaded over 500,000 times! But what is the app itself like? Here’s a look at the inside. When I first opened the app, I was greeted with a screenshot of the inside. Here’s a screenshot of the screenshot (yes that was a cheesy thing to say… no I do not regret it). I scrolled though a few other screens that gave us a run-down of the features, before I came to this. This is an example of what the app costs to use. So, as you can see, there are some fees that you will be expected to pay to use Stash. But they are really small. You only need to pay $1 a month to use the App if you have less than $5,000 in holdings… and after that, you just get ping’d with a small 0.25% yearly fee. I can tell you right now that this is a much better deal than you will find with any local stock broker. Not only can you start investing on Stash with a fraction of the amount of capital, but the fees are also tremendously reasonable. So far, I was impressed. I feel like people who are interested in investing will probably not be discouraged by these fees, as they really aren’t that bad. I know that I wasn’t dismayed by them in the least. Plus, you get three months free—which is awesome! On the next screen, I was prompted to ‘start investing,’ which basically meant that it was time to make an account. Here’s a screenshot of the screen that gave us a rundown of the process. Making an account on Stash is a bit more in-depth than you would expect from a typical app… but there are a few different (and very legitimate) reasons for this. They say on the basic information screen that all of your information needs to match your government issued ID, because you actually need to verify your identity to use Stash. But this is reasonable. It is, after all, an investment app. So plan on using your full, real name. No nicknames or anything like that. After you fill in your information, you need to link your bank account and select what investments you want to make. 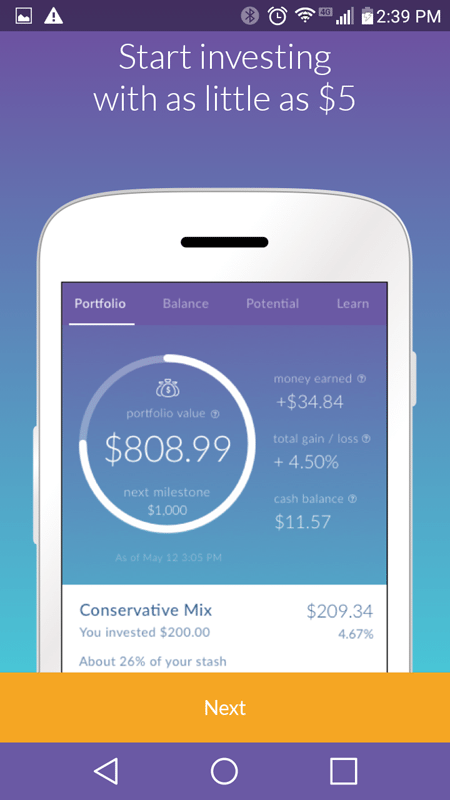 As I took a look at the app and played around with it, it became apparent that this wasn’t a robo-advisor. When it comes to apps or programs that help you with investing, a lot of people are afraid of their money being shifted around without them realizing what is going on. But with Stash, you won’t have to worry about this. 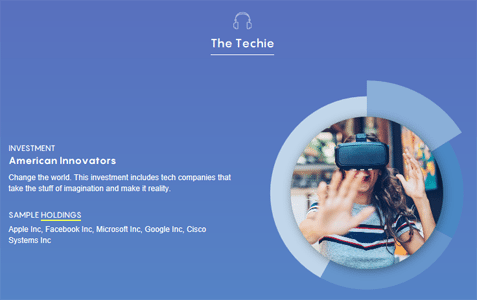 It uses exchange-traded funds that are branded with catchy, easy-to-understand names to help guide investors toward the type of investments that they might be interested in. It’s certainly not an auto-investment tool. Rather, it is a tool that’s perfect for helping new investors through the process of choosing which portfolios they wish to place their money in. One thing that I really liked about Stash was the investment portfolio setup. Rather than giving the investor the huge, complicated task of choosing individual companies, funds are organized into categories that will help investors to personalize their investments without being forced to take part in the time-consuming, bogged-down process of selecting specific organizations or funds to invest in. Here are just two examples of portfolios that you can choose from on Stash. 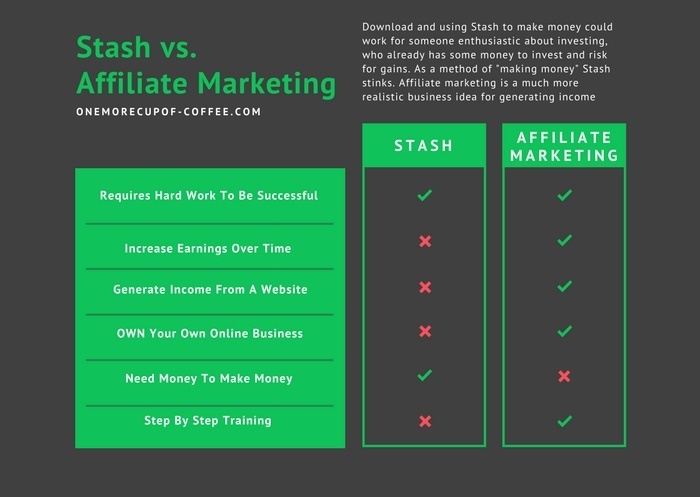 But Can You Really Earn Money On Stash? The real question here, obviously, is whether or not you can actually make money on Stash. And the answer seems to be a doubtless yes. This tool, which you can access within the app, does a pretty good job of showing you how you can predict trends and earnings through your investments. Investing tends to be a pretty scientific process, to be honest. You’ll find that sometimes, your numbers may tend to dip—but for the most part, you get to choose your risk level and stick with that. If you’re not interested in volatile investments, then you can just go the low-risk route and bypass that problem. Stash makes this really easy. So while investing money isn't “making” money, the GROWTH you see from investments is definitely a profit. Heck, the government taxes it right? It is also very apparent that users on Stash are earning returns on their investments. 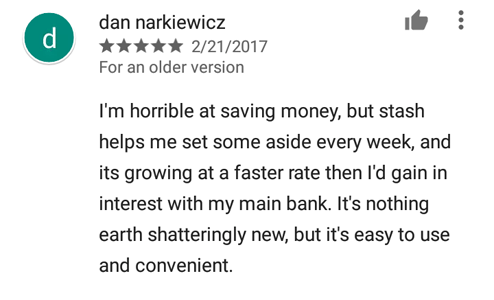 Here is an example of a review from the Google Play store where the users reports earning more back from the money invested than they would from a savings account… and there are really all kinds of reviews like this one to be found if you browse through them. Of course, it is important to understand that Stash is not a get-rich-quick idea. It’s an investment app that gives you access to affordable investing options from the comfort and ease of your smart phone or tablet. If you aren’t going to be putting some money aside and investing it with the app, then you aren’t going to make anything. Also, this app isn’t designed to make you a ton of money right away. It was designed to help you build your account slowly and surely—which is what investing is really all about. What are the downsides to Stash? While I see the Stash fees as very reasonable, especially for what you get—I will say that getting 0.25% taken out in the long term on much larger accounts could add up to a lot. Let’s say that you do really well and end up with $10,000 dollars at some point. The fees on this would add up to about $25 a year. This doesn't seem like much of a downside to me, really. I also feel that Stash could, however, begin to get clunky if you started to really learn a lot about investing. 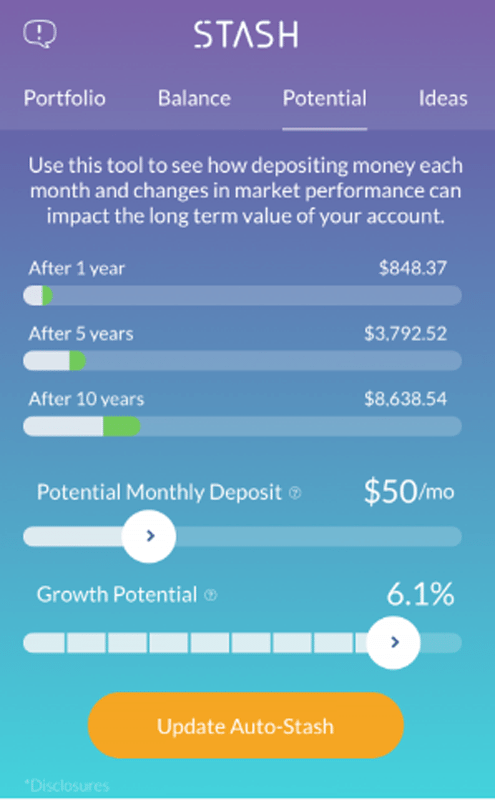 If, for example, you wanted more control over specific investments, then you might outgrow this app eventually—but for a beginner or someone who doesn’t want to bother with tedious investment details right away, it’s awesome. The other downside is that you actually need money to invest. Many people are looking for ways to actually “create” money, as in…an online job. For actually making money, you'll need to look somewhere else. Stash is an awesome app. It works well, the interface is intuitive, it makes investing easy (I cannot stress this enough—it really is a no-brainer), and it brings the business of stock brokers and Wall Street right to the tips of your fingers—which is very cool. Getting set up and verifying your identity takes a bit of time and effort—but once you get it all set up, you’re really good to go and don’t have much to worry about. If you are a pro investor with years of experience and know-how, then you might find this app clunky and overly simplistic. You might also grow tired of not having more options. But if you’re a typical person with a cell phone who would like to start investing and saving a little bit for the future, and don’t quite know how to start and don’t have a ton of capital to start with, then this app was literally designed for you. There really isn’t much more to say about it. You can get 3 months for free if you sign up for it—but you’ll still have to risk at least a little bit of money to get started with investments. You can do it for as little as $5 though—which is pretty amazing! It's going to take money to make money with Stash. If you don't have a big roll to invest right now, this is not going to produce income for you. Nothing against the app, but I'd prefer to invest that money into building a business that can produce income for me. 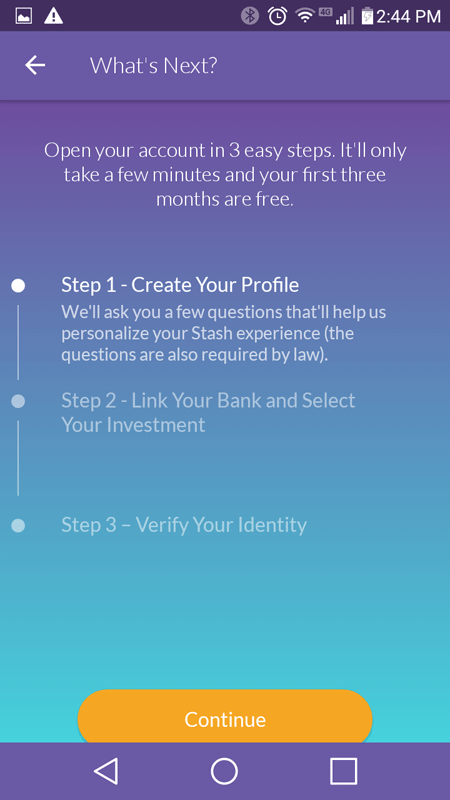 Stash tries to entice you with $5 to sign up, but in reality, to “make money” you're going to have to invest money. This isn't a way to make consistent income. A few years back, I learned how to make my own website and earn a FULL TIME income online. After a few months of working on my business I was earning consistent income and within two years I was generating over $10,000 per month. Whether you decide to make money using Stash or to use my method, at the very least I suggest you check the training I used and continue to use to achieve my success. I will also be there to help if you ever need anything. ==> Instead of Stash, Make Some REAL CASH! And stash is continually adding new features ,they have a debit card linked to your account which earn cash back and they just added some way to earn stocks every time you make a purchase. The options for learning ,investing and making money have expanded and continue to grow. And Stash is nice little app/biz to get started with esp if your new uninformed and low income. Thanks for taking the time to let us know about your experience with Stash Chance! This is more a question: I only have the $5 to start and only $4 or $5 a month to invest. Realistically, how much money, on average/ approximately, can I expect to make? With any investing, conpound interest is the key. While its only small amounts now, you probably will get a raise in the future, and you can invest more. If you pay off your debts, you will have even more. Nathaniell I didn’t see a complete reply to Mary Bakers question about being able to cash out, I am also thinking of using Stash. I too don’t have much but want to save some money..not expecting to get rich but dont want to lose what I have…can you cash out whenever you want with Stash and are you locked into this for a certain amount of time? You’re able to cash out whenever you want, however you may have to wait a couple days for all the transactions to go through and the money to end up in your bank. How long did it take before your 200 turned to around 900 dollars? Also where did you learn how to create a website? Was it self taught, or did you pay for a course? Lastly any advice for a seventeen year old in terms of making money/investing? I’m not sure where you got these two numbers. Are you referring to the article above? It depends on what you invested in. It’s impossible to say just based on broadly investing in options and puts. 0.25% of 10,000 is 25, not 250 as you stated. .25 percent of $10,000 is $2500.00.